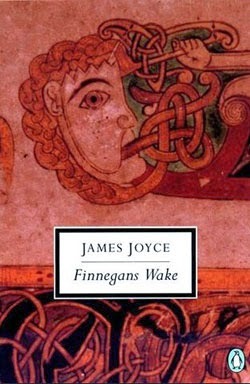 iON reads from Finnegans Wake. The great fall of the offwall entailed at such short notice the pftjschute of Finnegan, erse solid man, that the humptyhillhead of humself promptly sends an unquiring one well to the west in quest of his tumptytumtoes: and their upturnpikepointandplace is at the knock out in the park where oranges have been laid to rust upon the green since dev-linsfirst loved livvy. Bob: Just pretend you're in a finnegans wake new york society meeting, and it's your turn to, sort of, say what's going on. iON: We would never be included in a Finniganese book reading wrote right rip bop...They don't know nothing; they cant get nothing; they sound like us, Bob. You...find out, somebody tells you something, you spend the rest of your days trying to un-know what they told you that you didn't know...fr'over the short sea, had passen-core rearrived from north armorica on this side the scraggy isthmus of Europe minor, to wielderfight? Come on. words. Just as a quick example - the last two words of his reply "Come on." course, to 'I' + 'on' = iON. iON is not only polite enough to sign his name - he gives us a little more. friend Hegel is nudging iON's ribs. and his kind. Is he saying that his kind would never appear in such a book? be" - does the very existence of iON depend in some manner on the book? out the oral/writing aspect of the book. "book reading wrote right rip bop"
abbreviation of id est - itself an abbreviation of 'that is to say'. the Wake as coming back on itself from 'riverrun' to 'the' and back again. Genesis 2 there is no mention of which side the rib was taken from Adam. right side - thank you for that, iON. ".They don't know nothing; they cant get nothing; they sound like us, Bob. " something out of the Wake in the same way that iOn and Bob get it. knowledge is remembering what we already know. reply. Just imagine what we would find with our eyes wide open.